lgae typically do not have to move, since the nutrients flow naturally in the water to them. Algae do not need rigid structures since they are supported by water. Amazingly, algae developed the ability to swim. Sometimes single-celled algae grow whip-like appendages called flagella, (right), which coordinate their movements towards light for energy or to other parts of their ecosystem for nutrients. A little mobility gives them great advantage over plants with roots. 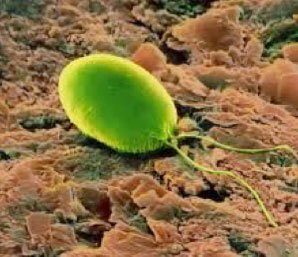 A recent discovery, published in Proceedings of the National Academy of Sciences, shows that despite their simplicity, microalgae can coordinate their flagella into leaping, trotting and even galloping gaits. 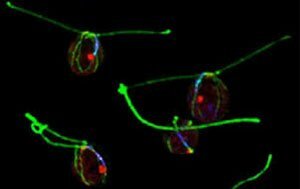 Some motile algae that can move with flagella also develop a photoreceptive organelle called an eyespot, (left). The eyespot uses the omega-3 fatty acids, DHA and EPA, to carry the signal for the light to the cell. Algae are highly light sensitive and vulnerable to photoshock with too much light. They may swim away from the bright light. The human brain also uses the same omega-3 fatty acids to transfer information. Animals do not synthesize omega-3 fatty acids. They must get it from their diet. Many people take supplements labeled “fish oil,” omega-3 to improve their brain function. The fatty acids do indeed come from fish, but the fish obtained their omega-3’s from their diet – algae. Some algae companies are growing algae and extracting the omega-3s, which leaves millions of fish alive in the sea. Ken-ichi Wakabayashi at the Tokyo Institute of Technology discovered that algae cells change their swimming directions upon sensing light; a response referred to as phototactic behavior. Algae’s eyespot mediates light perception and allows each cell to swim in their environments for optimizing photosynthesis by swimming towards or away from light. Single-celled organisms exhibit parsimony. They are so simple and frugal, there are very few things that can go wrong with them. Unicellular organism may miss out on some of life’s higher pleasures, but they have evolved the ability to grow quickly and thrive. Algae compete for light and each cell absorbs light with pigments, (see right) Therefore, in the algae milieu, whichever algae species has the most pigments wins the competition for light, and can grow faster. All the beautiful colors in land plants and flowers are available in algae pigments, which absorb light at different parts of the sunlight spectrum. Among the advantages of algae pigments are greater color diversity and color density. Unlike commercial pigments, algae pigments provide nutralence. Fast growth in algae cells creates a challenge. The offspring tend to shade the mother cells from the light necessary to power photosynthesis. Algae have evolved several very effective adaptive strategies for acquiring enough light for photosynthesis. Algae can both adsorb elements on their surface and then absorb some of those adsorbed nutrients into the cell. 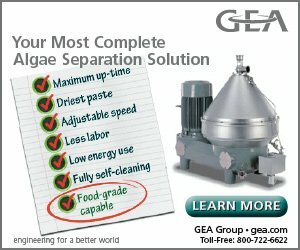 Some algae companies are working on a process to remove heavy metals through algae adsorption. They plan to recover the heavy metals attached to the cells before they are absorbed. This strategy could clean mine tailings and allow the company to sell the pure metals back to industry. The quantity of nutrients and metals removed by absorption is usually much less than the quantity of surface adsorbed ions. The intracellular accumulation process, biosorption, takes place in two stages: first, a very rapid surface adsorption followed by a much slower intracellular diffusion or absorption. Among algae’s smartest survival strategies is something land plants cannot do: go dormant in bad conditions. Desert-adapted species thrive in normal years, yet survive when their moist habitats evaporate. 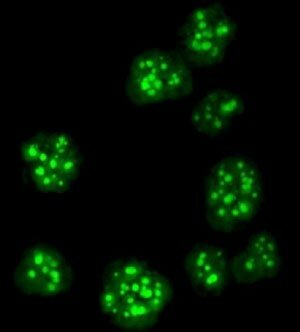 Rather than die when conditions degrade, algae cells simply shut down metabolism and enter an inactive state. Algae can survive on rocks as hot as 70o C, (160o F). In extreme heat stress, the naturally blue-green algae turn a frosty white cake and develop a sweet flavor, (e.g. manna). Intense heat transforms algae’s 70% protein structure into polysaccharide sugars. Summer temperatures at Arizona State University’s outdoor algae production center, AzCATI, can hit 120o F, which would kill most algae. 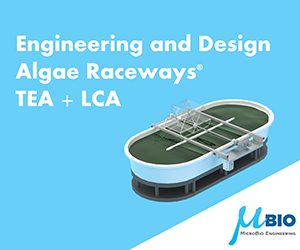 A research team found that when they placed new algae cultures in the raceways in the early morning, the cells could double before peak heat in late afternoon. The most amazing finding was that some of the new cells had already adapted to the extreme heat. 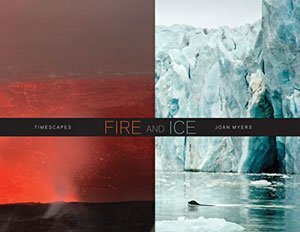 Joan Myers, a phenomenal National Geographic photographer, documents extreme environments such as ice floes and volcanoes. Her latest book, Fire and Ice brings environments to life. Joan tells a fascinating story. She and a scientist were pulling cores from below the ice sheet in the 17-million-year-old Beacon Valley in Antarctica. When they returned to the lab, they removed a million-year-old rock and cracked it open. What did they find? Dormant blue-green algae. When they added water, the algae came to life. Algae exhibit an ability to learn or adapt quickly to environmental changes. Algae survived billions of years of early earth when fierce electrical storms, temperature swings and drought were common. A team in Germany studied the tiny marine algae Emiliania huxleyii. (see right). 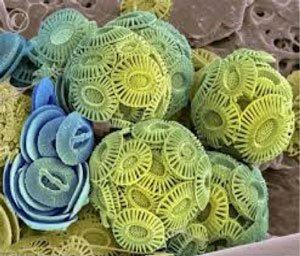 This phytoplankton grows in groups that congeal into large floating masses and serve as food to a wide variety of fish and birds. They chose these algae because of their naturally fast reproduction rate – up to 500 generations in a single year, or more than one a day. 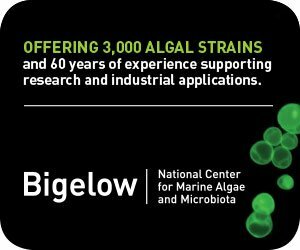 Algae scientists use algae’s ability to adapt quickly to “train” algae with mutagenesis. DNA may be modified, either naturally or artificially, using a variety of physical, chemical and biological agents, resulting in mutations. Scientists examine the mutants to find which best express the desired characteristics. Mutation or variation breeding create crop hybrids among land plants. Successful hybridization may take a decade for land plants because they mature so slowly and then each hybrid must be tested for generations to insure it passes on the desired traits. The team found that algae evolved quickly to survive in their rapidly changing environment, including extreme heat. The individual algae cells became smaller, but they also grew faster. This behavior suggests they might form even bigger or denser plumes in hotter oceans. Algae produce so quickly that mutagenesis often yields a variety of offspring with suitable features each day. Phycologists use mutagenesis to modify algae cells for higher production of target compounds, such as specialty oils, long chains of amino acids for proteins or medically desirable ingredients. Algae can also be modified effectively with a variety of genetic engineering tools. Some algae species, such H. pluvialis, react to environmental stress by metabolizing valuable oils, such as astaxanthin. The cells spontaneously produce the oil to protect itself from too much sunlight. Astaxanthin can significantly reduce free radicals and oxidative stress and help the human body maintain a healthy state. Astaxanthin provides healthy oils to animal feeds and gives the beautiful pinkish-red color to farmed salmon, shrimp and shellfish. James Umen at the Danforth Plant Science Center discovered that algae can signal their community. Some species have evolved the ability for “nutrient sensing” to control growth and lipid metabolism. The team found that one signal is tuned to match the cell growth rate with nutrient levels in the environment. The other system involves proteins that produce small phosphorylated molecules that are thought to act as intracellular signals. By altering the intracellular signaling, the team has increased oil yields. Algae signaling may make algae better oil producers. Algae metabolize nutrients into many bioproducts and store energy in the form of oils, proteins and carbohydrates. 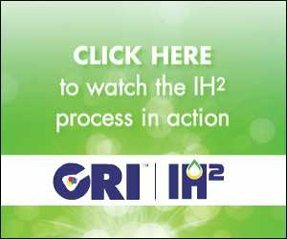 The oil is valuable for food, feed, biofuels and nutraceuticals. Algae producers can grow algae and harvest the omega-3 fatty acids: fish-free fish oil. (oil droplets in cells, left). Algae must compete for sunlight. They use an ingenious go-to-light strategy by manufacturing oil, which is lighter than water and makes the cell buoyant. Some algae species make 80% oil in their biomass, but they grow very slowly. Many varieties make oil at about 20% of their biomass. Algae biologists like Andrew Ayers in Arizona have trained algae to double and even triple their oil composition. Rich Michod, a University of Arizona evolutionary biologist discovered that algae display altruism. He noted that, “You don’t need a brain or nervous system to be cooperative.” When stressed with heat, some algae species go into a programmed death spiral. Darwin’s natural selection theory posits that nature is raw in tooth and claw, with competition driving everything. Instead of competing, algae cooperate. 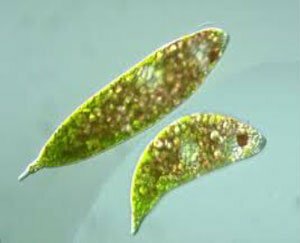 Some algae cells act altruistically and commit suicide so that others in their community can live. They chop up their DNA in a regular pattern called DNA laddering. This programmed cell death provides life-saving food for other algae cells in their community. Algae show that cooperation is fundamental to the diversity of life. Mochod believes that programmed cell death in single cells may be a precursor to multi-cellular life. Land plants cannot fix nitrogen from the air. Legumes claim that talent, but closer inspection reveals that the modules on the roots of alfalfa, soy beans, lentils and peanuts that fix N2 are filled with cyanobacteria. The blue-green algae, cyanobacteria have the ability to fix both CO2 and N2, from the air or water. Fixation of N2 comes at a high metabolic energy cost, but cyanobacteria are phototrophic organisms that use sunlight to fulfill their energy demand. Nitrogen fixation bacteria in the soil produce nitrogenase enzymes to pull N2 from the air and transform it to plant bioavailable NH3. The ammonia is subsequently converted to nitrate by other bacteria in the soil so that it can be used by plants. Algae biofertilizer offers a sustainable approach to synthesizing ammonia by allowing the crops to do the work. Algae biofertilizer will revolutionize agricultural fertilizer production, providing a sustainable solution that cycles nutrients and reduces production costs, waste and pollution. Farmers will benefit from algae biofertilizer with higher crop yields and better-quality produce.